When thinking about note values, always start with a whole. Many students start off reading quarter notes, and don't always understand what it is a quarter of. I like to make my chart as a grid. If you want to see how many eighth notes are in a half note, it is very easy to see where the line is drawn. I see a lot of charts that are set up like a family tree. Off of the whole note branches two half notes, off of each half note branches two quarter notes, and so on. This is a nice way of seeing each note divided, but it fails to show a more complete picture. When a dot follows a note it adds half of the note value. For example if you have a dotted half note it would be worth the same as a half note plus a quarter note. If we are in common time, and a half note equals two beats a dotted half note would be worth three beats (2 + 1). The same goes for rests. A dotted half rest equals a half rest plus a quarter rest. A note, or rest can have more than one dot. If a note has two dots the first one adds half of the note value, and the second one adds half of the first dot. A half note that has two dots is the same things as a half note + a quarter note + an eighth note. Basic notes are always divided up in half. When notes are divided up into thirds it is called a triplet. You can recognize a triplet by the number three written above or below the set of notes. The three notes are worth the same length as two of the notes normally are. If you have triplet eighth notes it is worth the same length of time as one quarter note. If you have triplet quarter notes it is worth the same length of time as one half note. Please feel free to download a more detailed note values chart in the downloads page. Besides being a good guide for students to reference it works as a great lesson/game in the classroom or at home. The chart can be easily cut out, and rearranged. The strips of paper will all be equal to the note length. 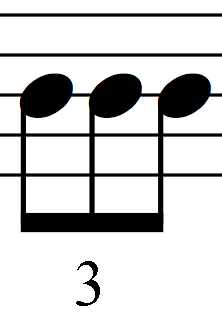 Three eighth notes put side-by-side will be the same width as a dotted quarter note.